An upgraded Beautiful, 1 Bed Condo with Great Views of Diamond Head and Ocean. 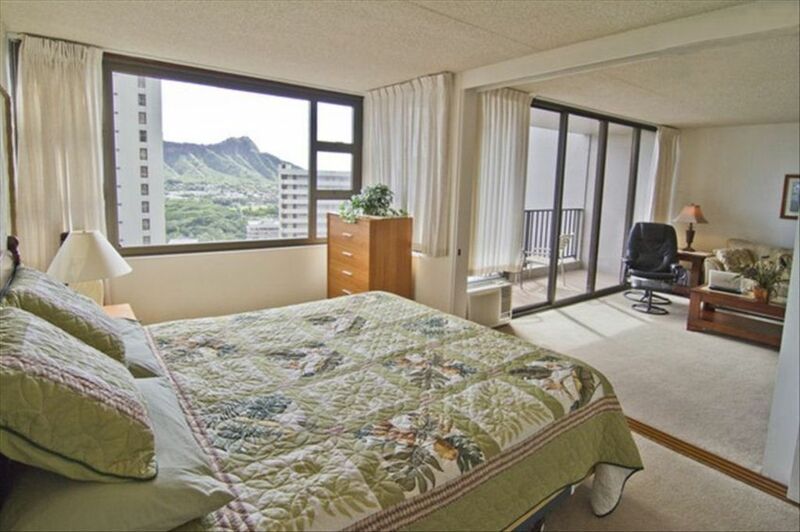 Unit 2601-1, referred to as 'Ocean Escape', for it's great Ocean and Diamond Head views. This Unit is a luxurious one bedroom Condo in the Waikiki Banyan complex offering great value for money! 'Ocean Escape' is located on the 26th floor of the popular Tower I, and is conveniently located one block from the Beach, and a couple blocks from the Zoo. The local bus stop is situated in front of the building and within walking distance you will find; Restaurants, nightlife, shopping, and activities for all ages. The unit comes with a Fully equipped Kitchen- pots, pans, utensils, cups, plates, bowls, coffee maker, grinder, toaster, rice cooker, and more... Full size fridge and stove, a spacious 1 bedroom with a King size bed, extra linens and blankets, night stands and a dresser. A pull out full size couch in the living room area and a blow up mattress allows for extra guests. The Unit is kept very clean and tidy, travertine tiled living room, carpeted bed area, separate door to bathroom. King Size bed en suite with sliding doors that close off the Living room area from the bedroom area for privacy. As the owner I care about my customers to have the best stay possible so that they may enjoy themselves and just have fun. Also included: 42 Inch flat screen TV/DVD and entertainment system to listen to your favorite Hawaiian music. There is an over sized Lanai to feel the breeze, check out the beach surf, or simply admire the majestic presence of Diamond Head Crater. -- Boogie boards to challenge your Agility ! The front desk and reception area offer a convenient pick up and drop off point situated between palm trees, tropical plants, and a Japanese Koi pond. There is also a coffee shop that offers up fresh island ground coffee. Come join us, and experience the tranquil and peaceful Spirit of Aloha...You'll be glad you did! **Note This is NON SMOKING unit and there are No pets allowed. We Love Hawaii, and especially the Waikiki Banyan. Location is awesome (1 Block from the Beach) Amenities are great for the whole family, especially kids. The spaciousness, layout of the rooms. And of course the superb Mountain and Ocean views!! Large Pool, two Jacuzzis, Coffee shop, Eatery poolside, Barbecues and picnic area on 6th floor, Location, great views. Close to shopping, Restaurants, and Night Life. Come join us for the fun! 25MB high speed internet with wireless router. Bath towels and beach towels provided. it's a great place for vacation! Great location, walking distance to waikiki Beach! Nice and clean home, the owner cares the visitors and provide all the necessary stuffs. We had wonderful stay there! Great place near downtown with an awesome view of the mountains. Amazing view of Diamond Head! Mike's condo is lovely and very comfortable. The view is amazing! Close to the beach and shops, having parking included is a real bonus in Honolulu. We would gladly stay here again. Mahalo nui loa. So glad we could host a wonderful stay for you. Thanks for looking after the unit. Look forward to seeing you again in the future. We loved it. The condo had all the amenities we were looking for. The property and owner were just a delight. We enjoyed our stay very much. Having the separate entrance to the bathroom was a huge plus. And the roominess of the bathroom was great. I had a wonderful stay in the condo. The unit was exactly as described in the listing. Comfortable, clean and had everything I needed for a wonderful stay with my two young granddaughters! We enjoyed the great location. Close to shopping, restaurants and of course the infamous Waikiki beach! We definitely took advantage of the bbqs and pool every evening! Free wifi and parking are a huge bonus!! The owners were very helpful, considerate and kind. I will definitely be booking here again next year and I would highly recommend to anyone looking for full size true one bedroom condo in Waikiki! Thank you so much .... We created great summer memories! I thought the condo was clean and comfortable. The free parking in the parking garage on site was great. I thought the location was awesome, approx. 1 block off of Waikiki, close enough to walk to all locations on Waikiki. I had a great stay! Waikiki Banyan is a very popular, family friendly Resort , with playground & large pool/tennis court/ basketball court/ outdoor BBQ area/ sundeck/ saunas with snack bar/restaurant on 6th floor deck. At the Lobby level there is a Mini-mart, Coffee Shop called the Banyan Breeze which also has an 'internet cafe, a beautiful Koi pond, and an Expedia travel desk. You can easily walk to the Beaches, nightlife, restaurants, Kapiolani Park, the Aquarium, the Honolulu Zoo, Waikiki Shell for concerts and entertainment, Safeway Grocery store is a 5 min drive away or you can walk 5 blocks to the smaller grocery store "Food Pantry"